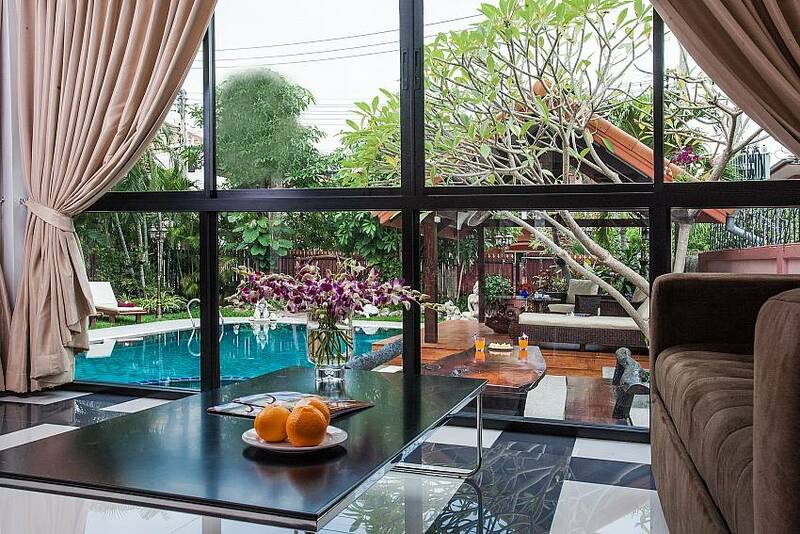 Baan Chatmanee is a stylish holiday home that uniquely blends Eastern and Western influences. 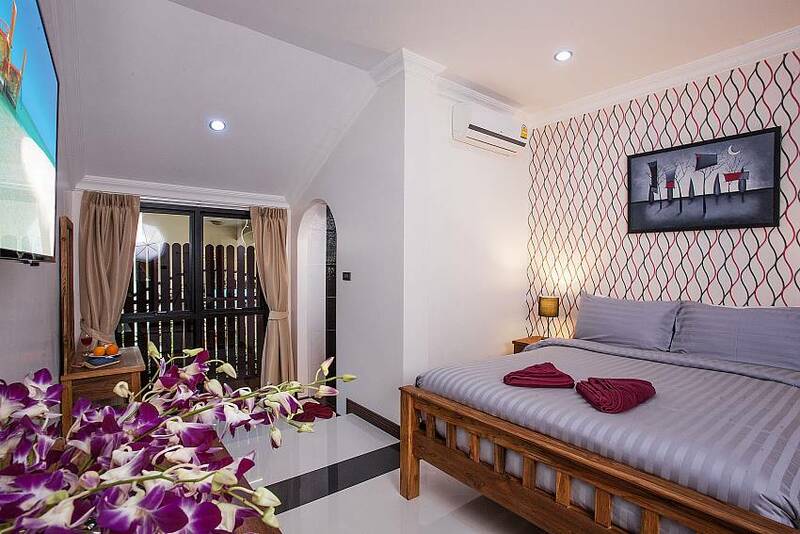 The villa has been fully rebuilt in October 2015 and it has a luxurious yet unpretentious feel to it. 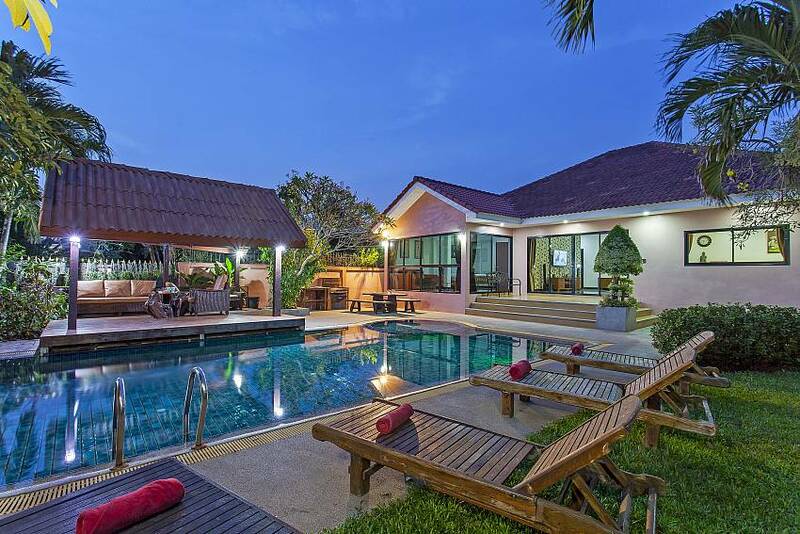 It is big enough for 10 people and perfect for families with children or large groups of friends, just a short distance from Jomtien Beach. 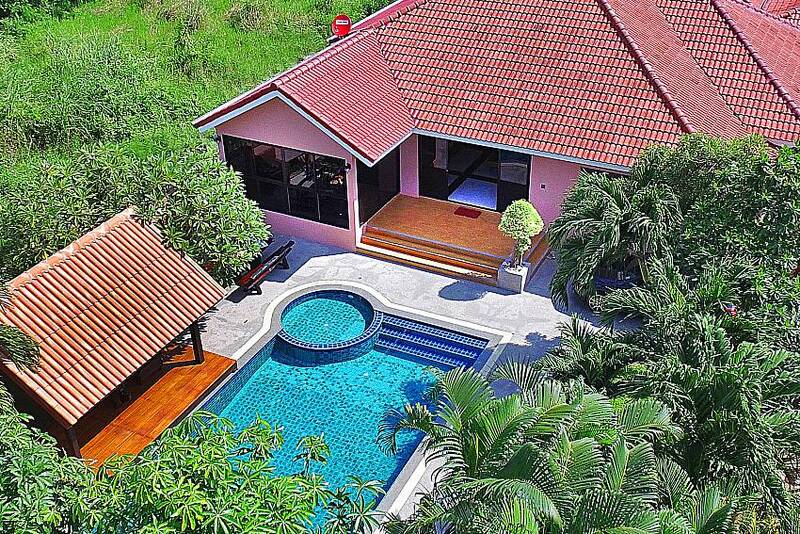 The large garden is a fantastic place to leave all your worries behind and fully unwind. 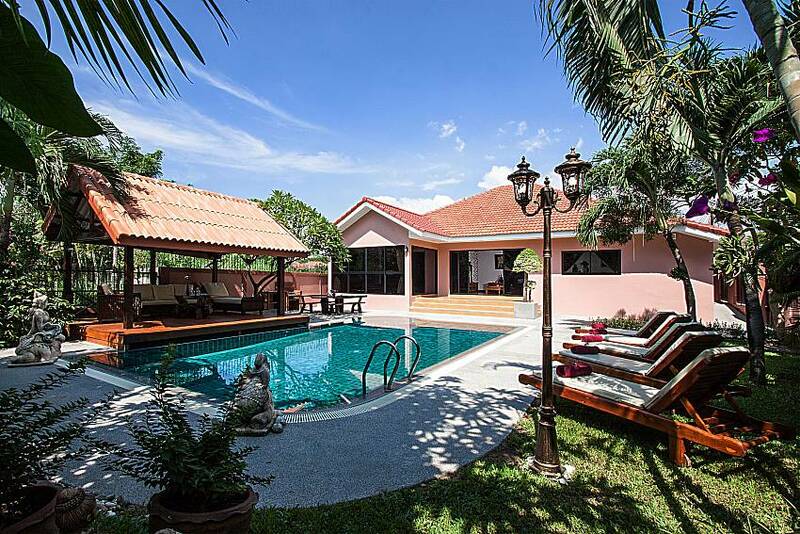 It features a private 45 square metre swimming pool with a 60 cm deep separate children’s pool, 5 sun loungers, a terrace with table and chairs for 10 people, a brick BBQ unit, a terrace area, and a stunning wooden Thai Sala with ceiling fans and comfortable seating. 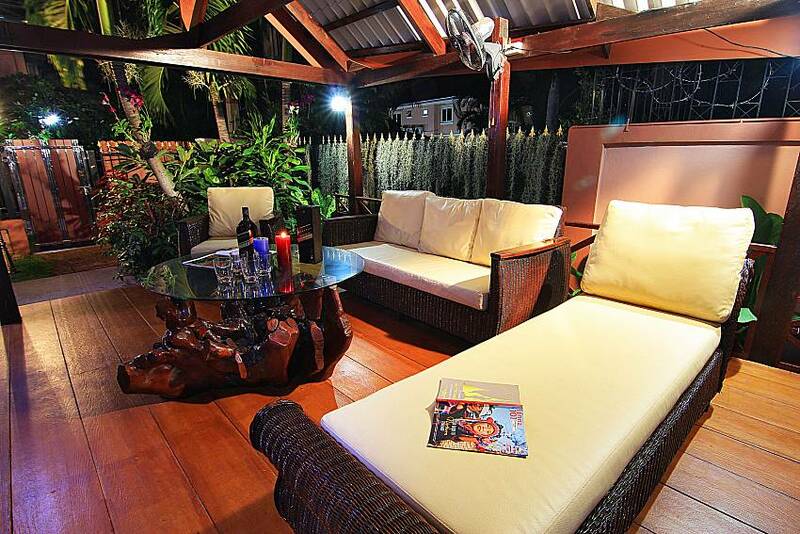 The whole family is sure to enjoy every corner of this tropical paradise any time of day and night. 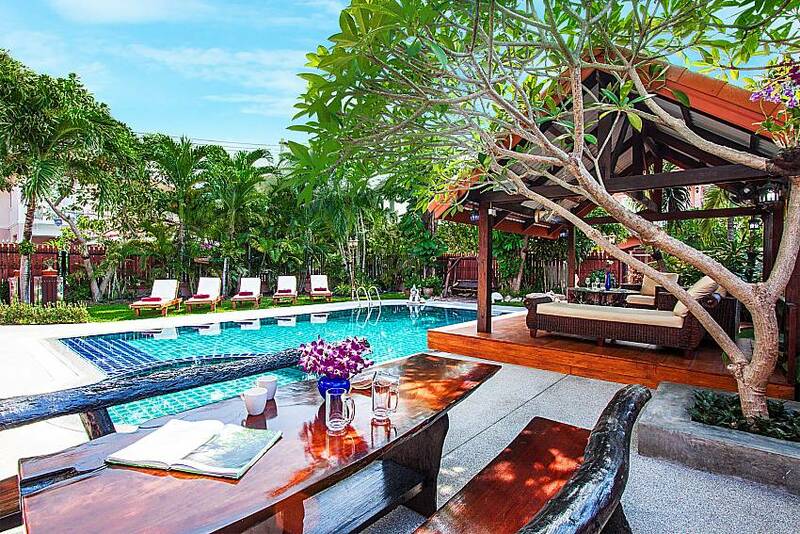 The villa features handmade teak furniture throughout, side by side with beautiful modern paintings and details. 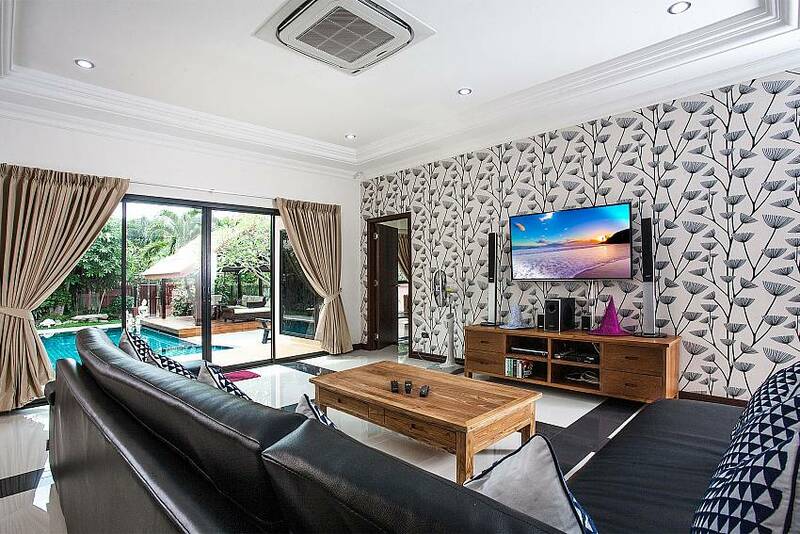 Its living room is open plan and spacious, offering direct views and access out to the colourful manicured garden. 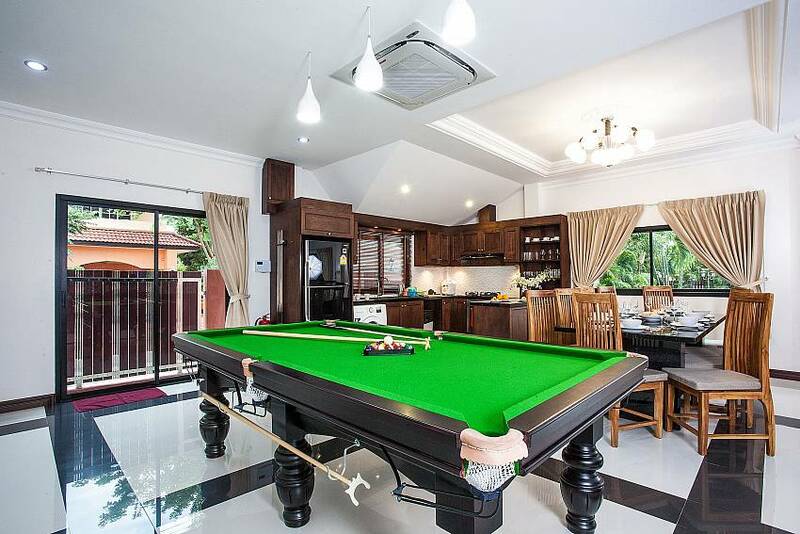 This area enjoys stunning art pieces and comes with a pool table. 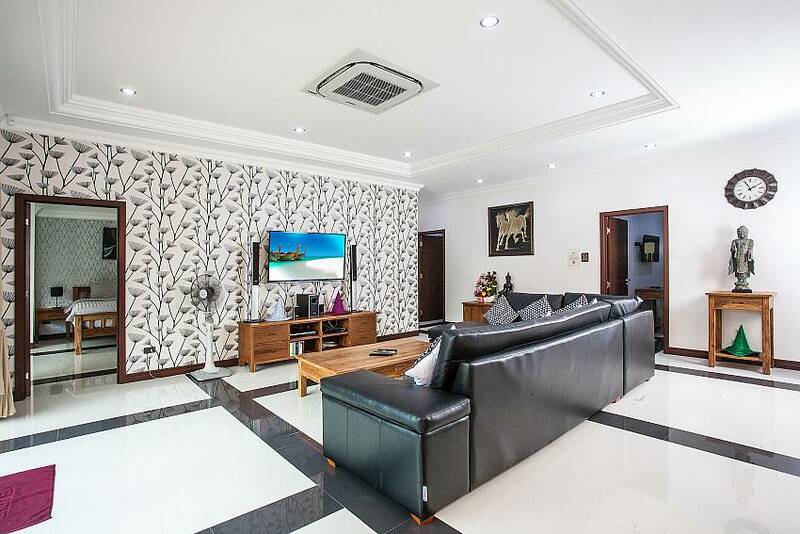 Here you will find a teak wood coffee table, a 6-seat black leather sofa, the latest edition of a 55-inch flat-screen TV with international channels, and a surround sound music system. 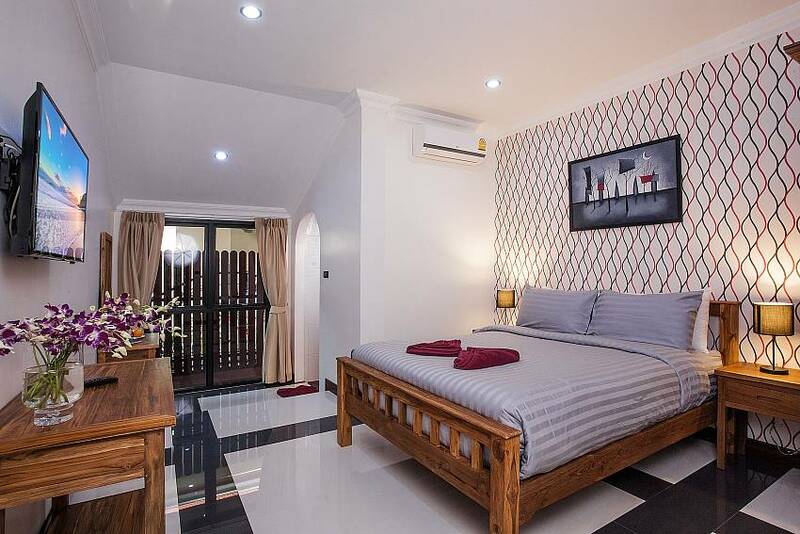 There are 5 spacious and luxurious bedrooms in total, all of which have en suite bathrooms. 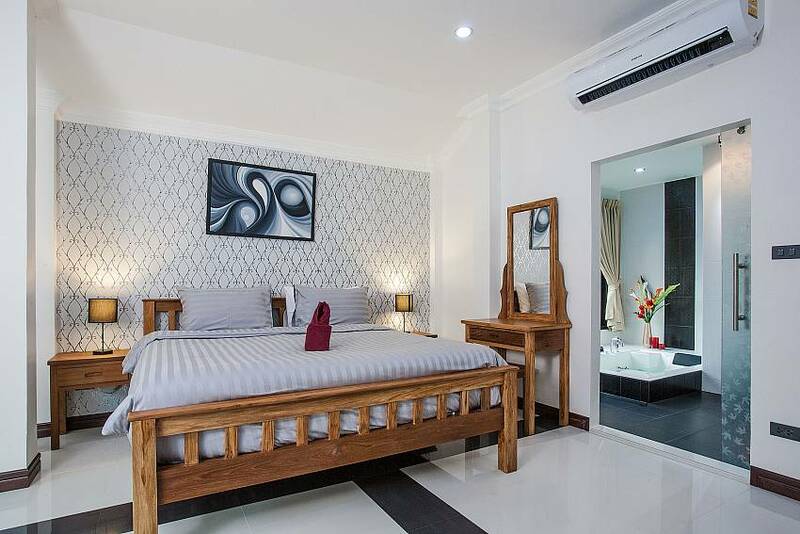 The bedrooms sleep up to 12 people (10 adults and 2 children). 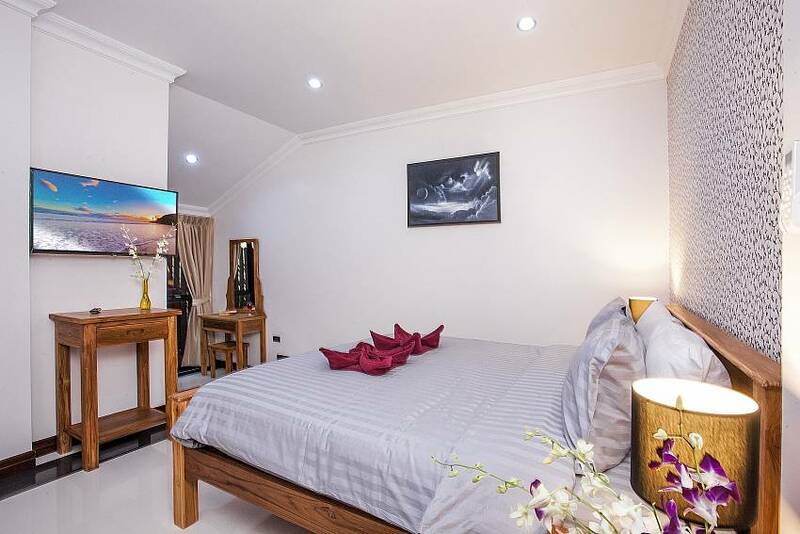 All bedrooms have double beds, vanity sets and side tables made from stunning teak wood, as well as televisions. 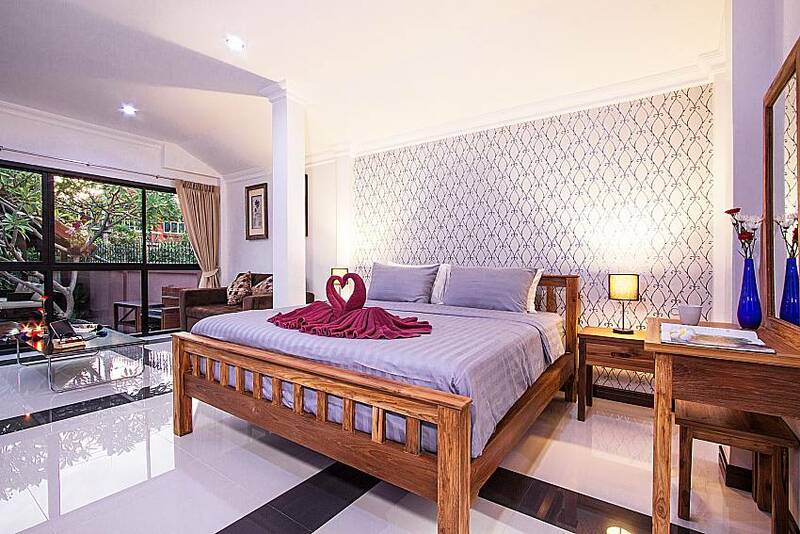 The Master Bedroom is a family room with an additional sofa bed for 2 children; it features tall windows that let in lots of light and offers direct access and views out to the pool area. 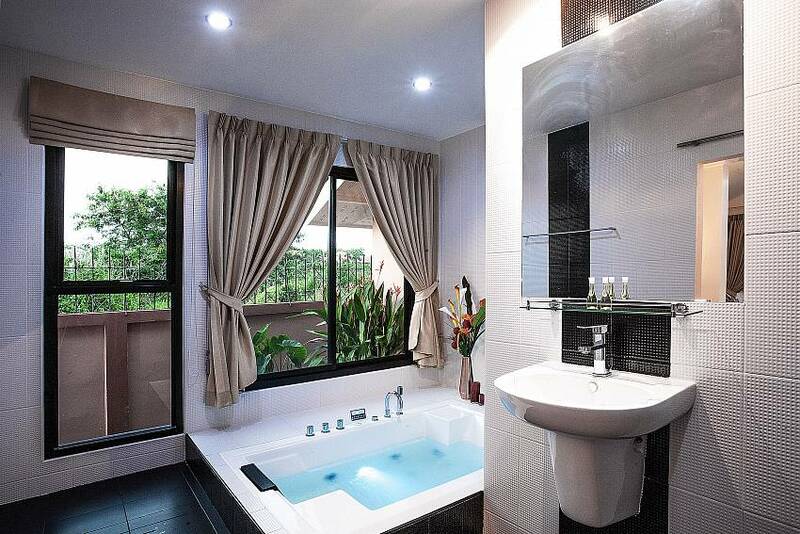 The master bathroom has a beautiful Jacuzzi bathtub. 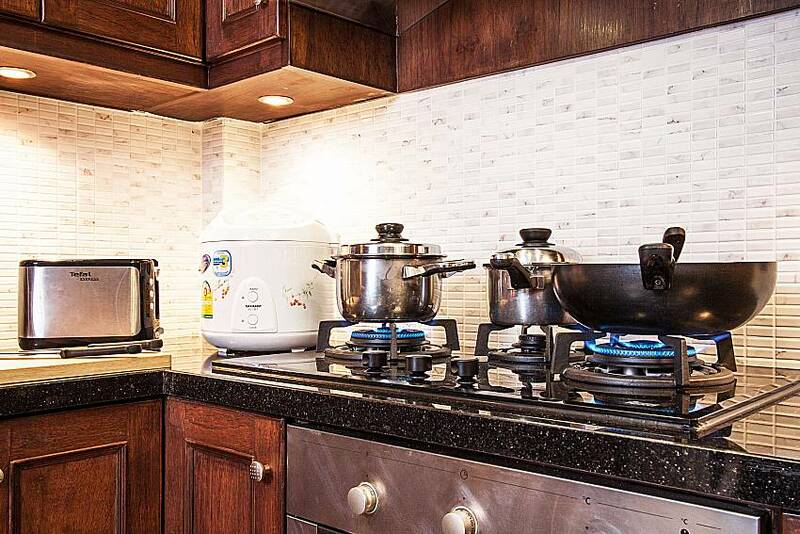 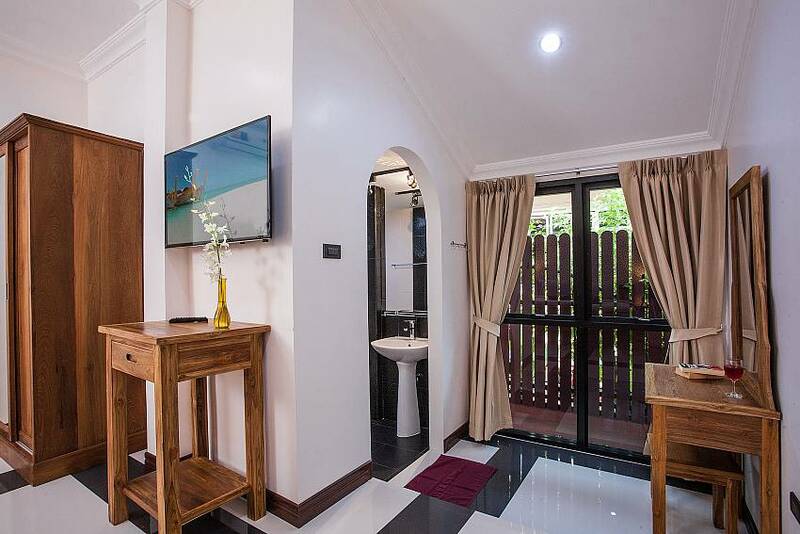 The villa also has an elegant kitchen with black granite countertops, and a wide range of classy appliances that include an oven with extractor fan, a fridge/freezer, a washing machine, a 3-ring gas burner, rice cooker, toaster and kettle. 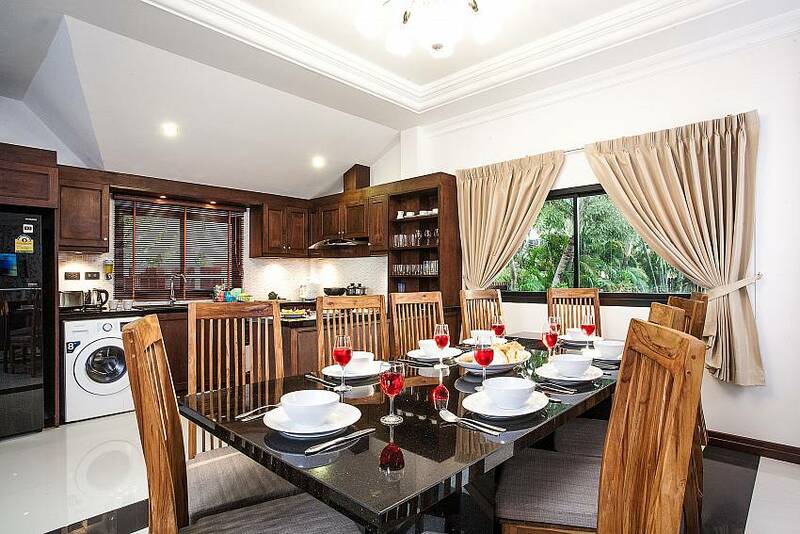 The dining area is located in the open plan living space and has a majestic, custom-designed black granite dining table for 10 people. 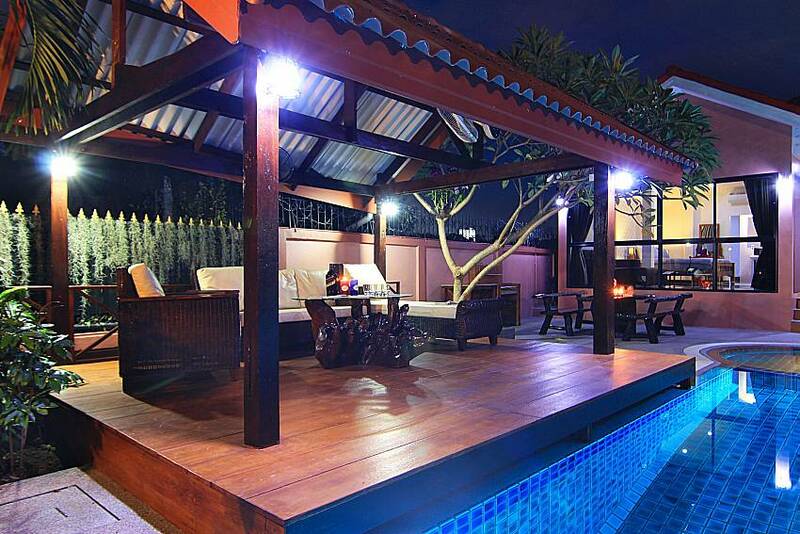 Alternatively, you can dine at poolside on the outdoor terrace or in the relaxation Sala. 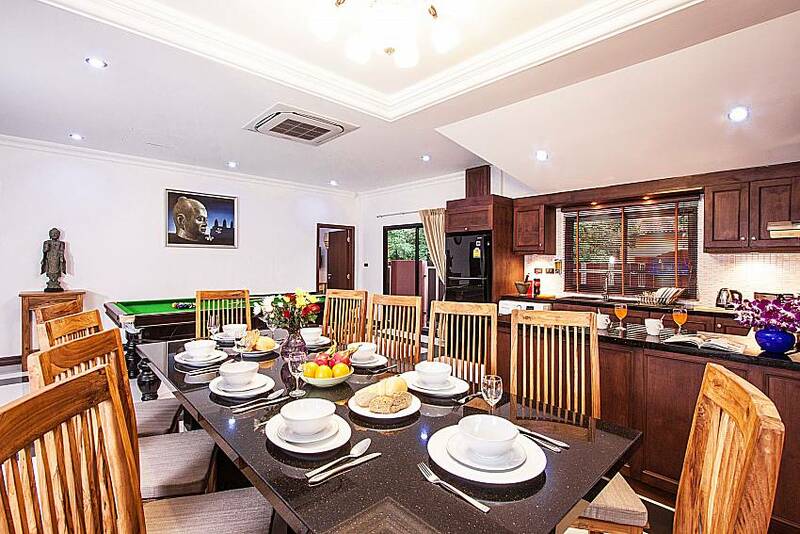 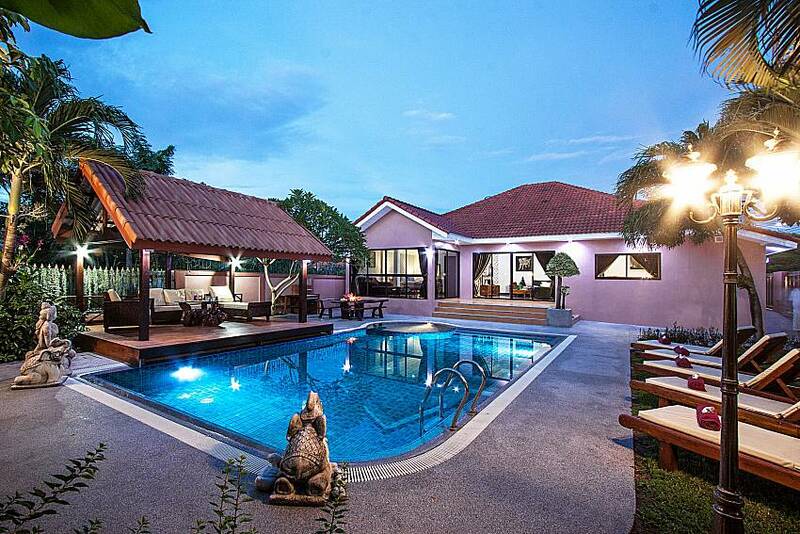 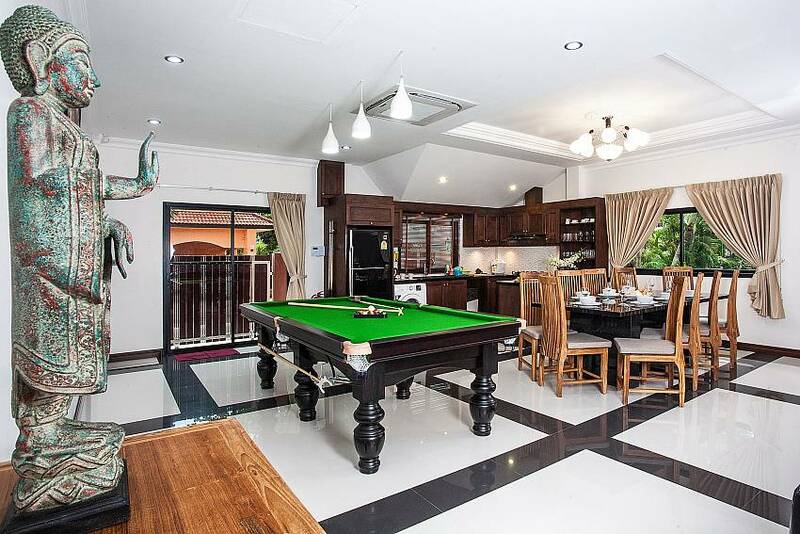 This villa is situated in a gated development just over 1 km away from Jomtien Beach. 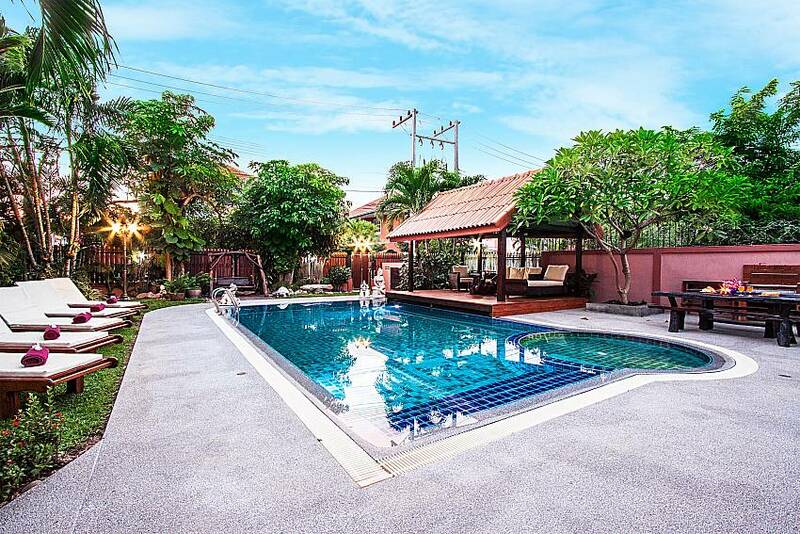 Within a 5-minute drive you can visit the beach, shopping centres, lots of convenience stores, bars, international restaurants and local attractions such as Pattaya Floating Market and Pattaya Underwater World. 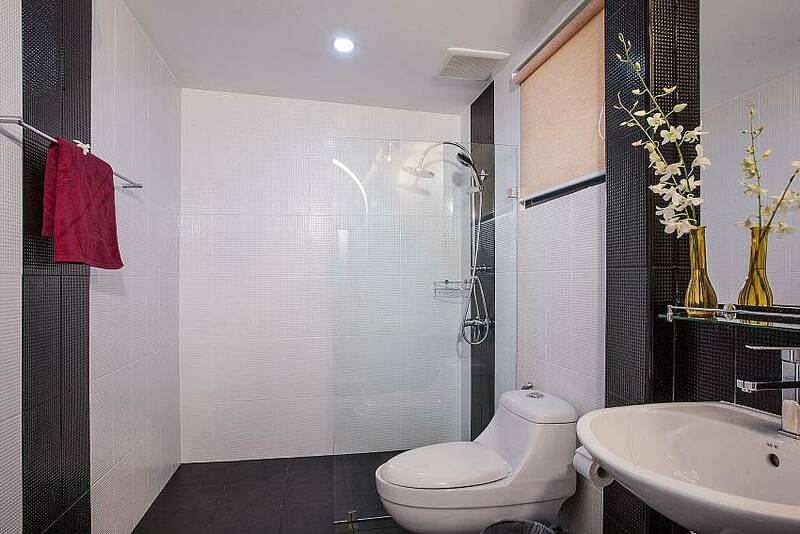 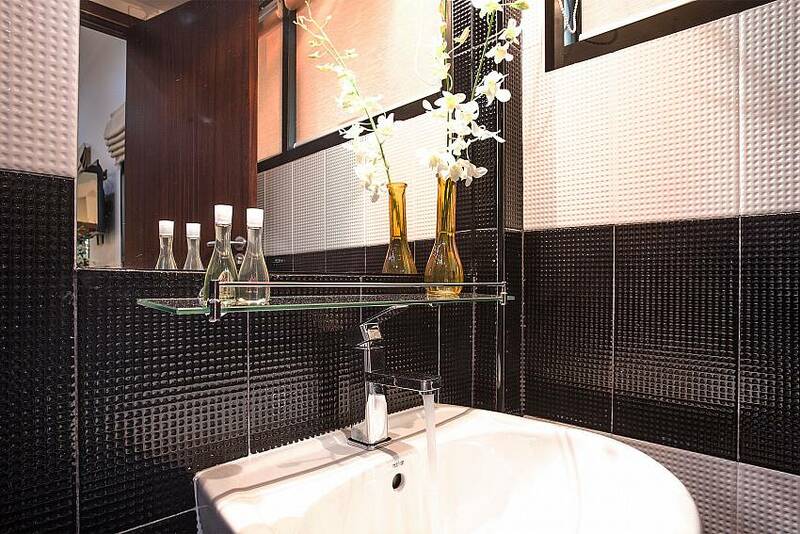 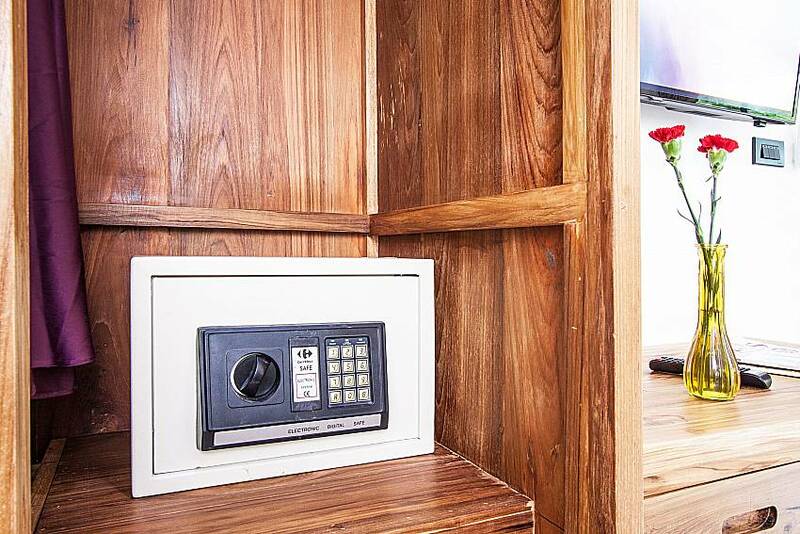 This is a location that merges privacy and convenience. 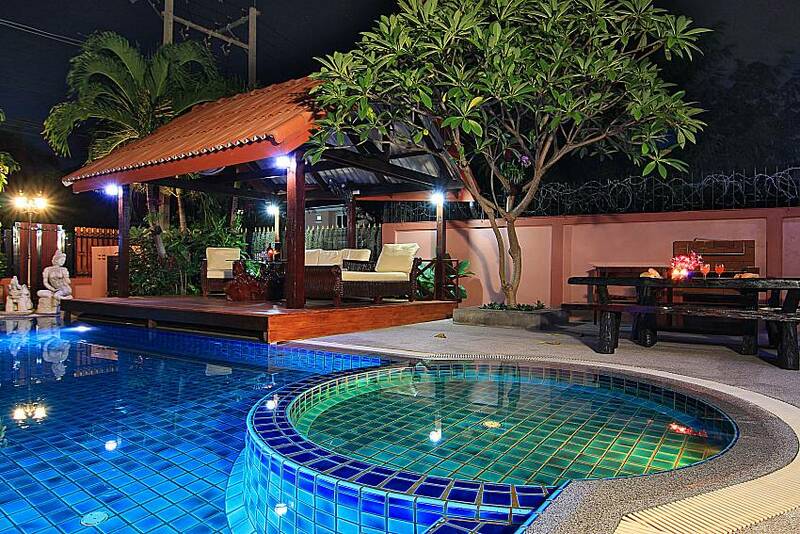 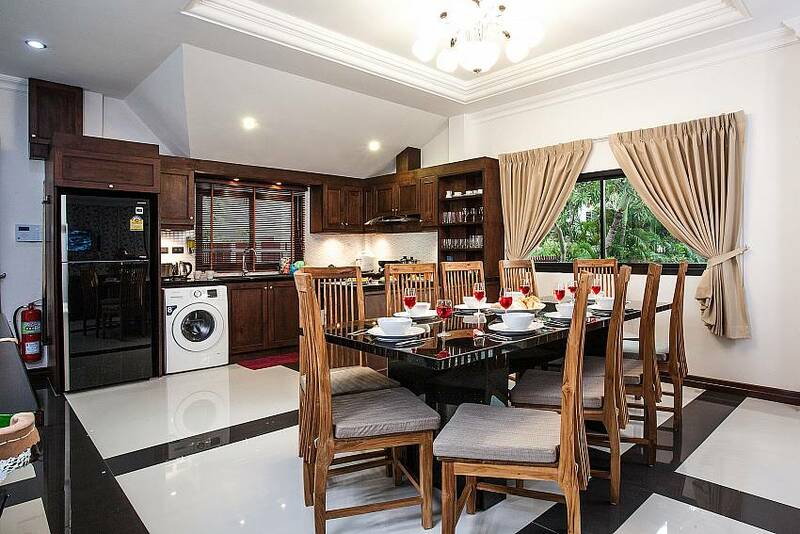 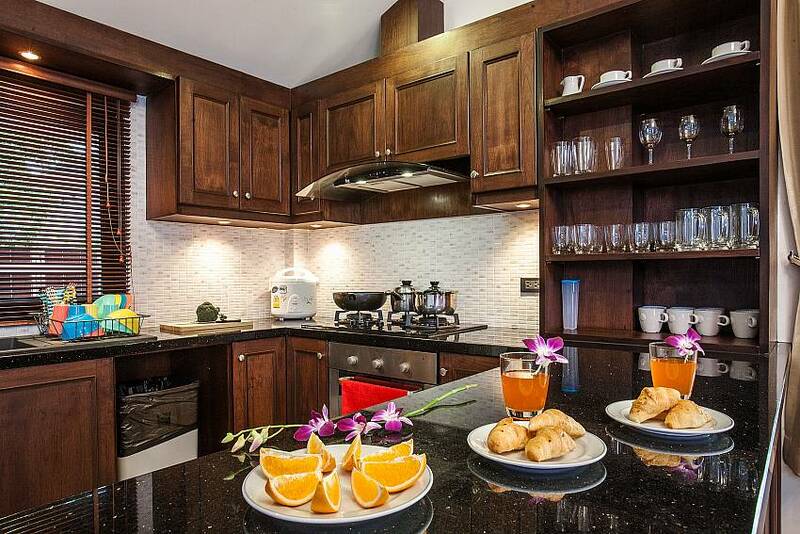 More villas for rent in Pattaya you can find here.